In the early hours of 22 June 1941 the Germans launched Operation Barbarossa - a code named for a massive invasion of the Soviet Union by three million German troops along a 1,250-mile front. For the Waffen SS it was to be the beginning of a struggle that would enhance its military reputation. But the military record of the Waffen SS was not one of outstanding bravery and operational effectiveness on every occasion. A disaster that happened in northern Russia would make them had swollen a first bitter defeat in Eastern Front. When he launched his campaign in Russia, Hitler had worried about the northernmost flank of that front stretched from Arctic Norway across Finland to the northern reaches of Russia, an area known to cartographers as Lapland. He feared that the British would attack this place and joined with the Russian from Murmansk to severing German lines with northern Finland and captured Petsamo and the Swedish iron mines just east of Narvik. To prevent it, Hitler called for operation that would stop the Murmansk railroad to become a dangerous spot for his position. The German High Command created two operations to sever the Murmansk railroad. One of them dubbed as Polar Fox. According this plan, two division launched from the town of Rovaniemi in central Finland would strike the Soviet strong point at Salla, then advance on the railhead at Kandalaksha, 220 miles south of Murmansk. As part of the same operation, another two divisions - both of them Finnish - would simultaneously cross the border to the south, one to help in the attack on Salla, and the other to cut the railroad at Loukhi. The operation command was given to Generalleutenant Hans Feige, a career officer with four decades experience, and Brigadier General Hjalmar Siilasvuo, the Finnish hero of Soumussalmi. Feiges objective was to capture Salla - now held by a 20,000-man Soviet garrison - then drive on to Kandalaksha, 90 miles beyond, and cut the Murmansk railroad. Siilasvuo, meanwhile, would cover Feiges southern flank while leading a Finnish advance on the railroad at Loukhi, 70 miles inside Soviet territory. Feige had 40,600 German troops for his part of the operations, including an elite SS-Kampfgruppe 'Nord'. He also commanded 12,000 men of the Finnish 6th Division. Siilasvuo commanded the Finnish III Corps, numbering another 12,000 men. General Feige planned a four-pronged assault on Salla. 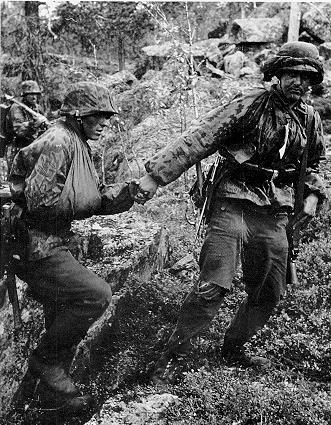 One of his German regiments was to advance along the Kandalaksha-Salla road for a direct attack on the garrison there; two more regiments would swing around Salla to hit it from the north, and Kampfgruppe 'Nord' would attack from the south. Meanwhile, the Finnish 6th Division would cross the Russian front 45 miles south of Salla and try to take the enemy from the rear. 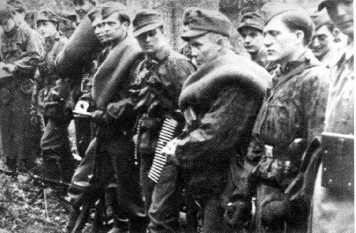 'Nord' soldiers before the battle. The undertaking got off to a poor start. The only one of Fieges groups that made any progress at all was the northern group, which advanced through the forest and got about three miles into Soviet territory. The frontal attack was stopped 500 yards across the border and thrown back by a Soviet counterattack. But the worst appearance comes from the supposed elite unit: SS-Kampfgruppe 'Nord'. SS-Kampfgruppe 'Nord', like all SS combat units, which were Hitler's favorites, was superbly equipped. It had two infantry regiments, a machine-gun battalion, an antitank battalion, an artillery battalion, an engineer company, all completely motorized and light-tank battalion. Unfortunately for the operation, the kampfgruppe abundance of up-to-date equipment was neutralized by a lack training. Actually, SS-Kampgruppe 'Nord' was formed for security of the Murmansk Road in Finnish Lappland. It members mainly came from former concentration camp guards and overage SS reservist. In June 1941, when the kampfgruppe assigned to the Army Group North, its commander, SS-Brigadeführer Karl-Maria Demelhuber, announces to headquarters that 'Nord' was unfit for combat due to lack of training: the officers had received no more than a short course of lectures and demonstrations of combat tactics; the artillery battalion had fired its guns but once; even the infantrymen had scarcely tried their weapons until their commanding general gave them a little target practice en route to the Russian front. Their rawness was to be a terrible handicap. Demelhuber requests 2-3 additional months for training before committing to combat. Unfortunately, his request was denies. The SS Command, especially Reichsführer-SS Himmler, believed that 'Nord' men's high moral and firm determination and the fact that they were motorized would overcome their military shortcomings. After all, they were the master race and their's enemy were only sub-humans. These wrong assumptions lead the unit into a disaster. On 6 June SS-Kampfgruppe 'Nord' was ordered to the Rovaniemi area of Finland for participation in the upcoming invasion of the Soviet Union. The kampfgruppe had only recently concentrated near Kirkenes and had to march the length of the Arctic Ocean Highway from Kirkenes on the Arctic Ocean to Rovaniemi not far from the Baltic Sea. By 10 June its forward elements had reached their destination and then began moving towards the Soviet frontier near Salla on 17 June along the single road allocated to 'Nord'. The order to attack didn't arrive until 24 June, but the actual date of the attack wasn't set until 1 July. 'Nord' was to make a frontal attack on the Soviet positions in front of Salla while the 169. Infanterie Division attacked on their northern flank and the 6th Finnish Infantry Division was to drive deep behind the Soviet 122nd Rifle Division to Allakurtti from the southern flank. 'Nord' was reinforced with most of Panzer Abteilung 40 while Artillerie Abteilung.496 and 520 provided indirect fire support. Stukas of IV.(St. )/LG 1 were to suppress Soviet artillery positions before the assault. This opening barrage had some effect on the defenders, but more importantly set much of the forest on fire, which severely degraded visibility for the Stukas and artillery observers. The fire also prevented the regimental heavy weapons from supporting the infantry with direct fire on Soviet positions. The infantry was unable to advance very far. The German advance was stopped in its tracks by the Soviet border fortifications. At the first sight of the Russians, some of the green troops of 'Nord' lost heart: they threw away their weapons and fled in panic or surrendered. Eventually they fell off in such numbers that the Soviets were able to leave them and concentrate on the other two groups to the north. The resulting three-day battle set the wood aflame, and Feige and his experience troops had all they could do to hold their ground. Feige finally got his center regiment moving and broke through the first line of defenses around Salla. Meanwhile, the 'Nord' regrouped during the 2nd and 3rd in preparation for the resumption of the attack on the 4th. However, the Soviets struck first at 0100 on the 4th with tanks in SS-IR 7's sector. The SS men bolted once more, and this time their fright led them to stampede. The men poured down the road toward Kemijaervi, shouting that Russian tanks were at their heels and that the bridges across the Kerni River had to be blown. Feige and his staffs stationed themselves across the roadway and spent several difficult hours getting as many careering vehicles and panicked men halted and turned around as they could. Some vehicles broke through their roadblock and raced all the way to Kemijaervi, 50 miles to the west. The flight of the 'Nord' men had left Feige with a gap in his force. The situation only was being saved by the action of the Finns and an army division. General von Falkenhorst, German commanding general of the theater, having lost faith in the fighting of the kampfgruppe divided its battalions among his Finnish and German Army formations. For Feige and von Falkenhorst, the poor performance of 'Nord' was simply confirmed once and for all that the SS troops were wholly unreliable. 'Nord' stragglers in the woods. At last, on July 6, Feige resumed his advance on Salla. 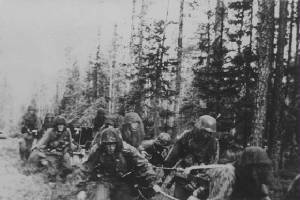 The 169.Infanterie Division, supported by two panzer companies, began attacking and by midday had reached Salla. The two armoured companies lost most of their tanks but had knocked out 16 Soviet ones within a hour. By 17:00 hours the town was captured, but the Germans were immediately thrown back by fierce Russian counterattacks. It was only through a Russian retreat eastwards that Salla was captured by the morning of 8 July. Most of the Soviet 122nd Division had escaped, but had left most of its artillery behind and all its 50 tanks were destroyed. The corps was proud to have captured Salla and inflicted such a stinging defeat upon the enemy, but von Falkenhorst commented sarcastically that the positions that SS 'Nord' had confronted could have been taken by raw recruits (von Falkenhorst's comments were quite unfair). SS-Kampfgruppe 'Nord' first taste of the combat had cost it 73 killed and 232 wounded. Another 147 were missing. The losses themselves were comparatively minor. But it breakdown Himmler's pride. Slowly and difficulty, the Reichsführer-SS faced up to facts. The Army commanders had not been entirely wrong in saying that the Waffen SS lacked sufficient military training and experience. He also admitted that the Russians, inferior though they were, fought on "like some prehistoric monster caught in a net". The 'Nord' itself slowly and painfully had to learn proper tactics at the front-line. Then, becomes a mountain division, they spend the remaining years of war from front to front as Führer's fire brigade. But at the end they were swallowed by Allied high tides.